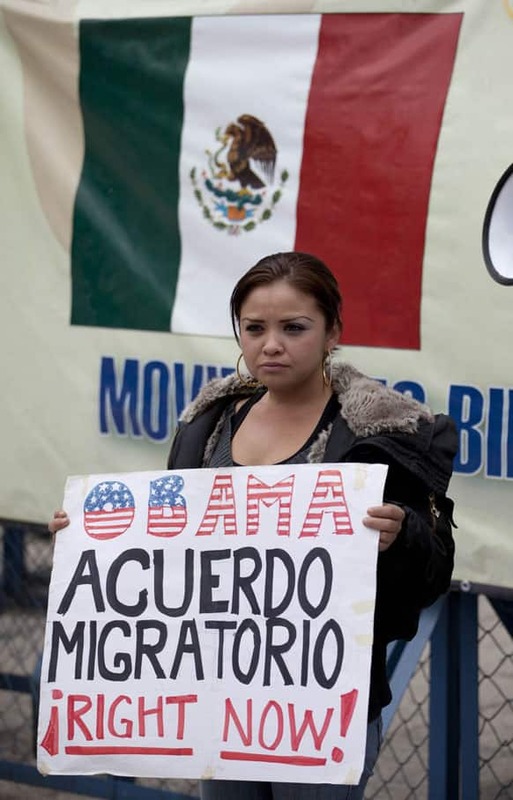 A migrants` rights activist holds a sign that reads in Spanish "Obama, migration agreement right now!" outside the U.S. embassy on Obama`s inauguration day, in Mexico City. 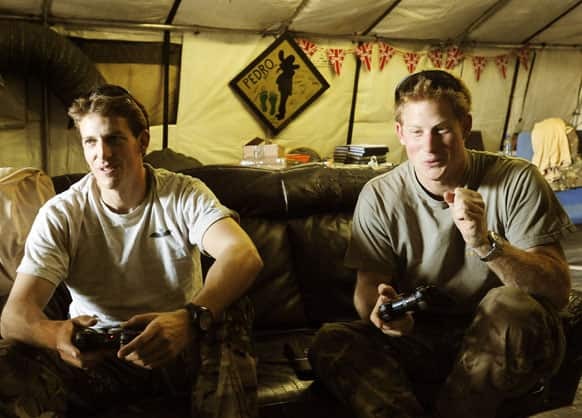 In this photo taken Nov. 3, 2012, & made available Jan. 21, 2013 of Britain`s Prince Harry, right, or just plain Captain Wales as he is known in the British Army, reacts as he plays computer games with his fellow Apache Helicopter crew, during his 12 hour VHR shift at the British controlled flight-line. 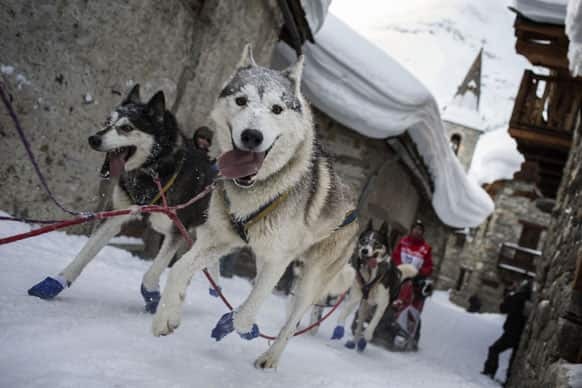 A musher competes with his dogs in Bonneval, French Alps, during the Grande Odyssee Sled Dog Race. 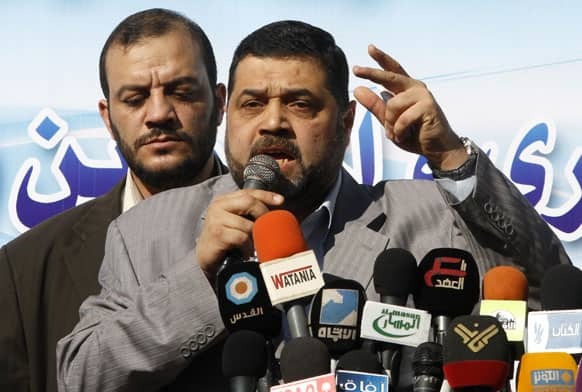 Palestinian Hamas leader Osama Hamdan, speaks during a protest held in solidarity with Palestinian prisoners jailed in Israel, in Gaza City. 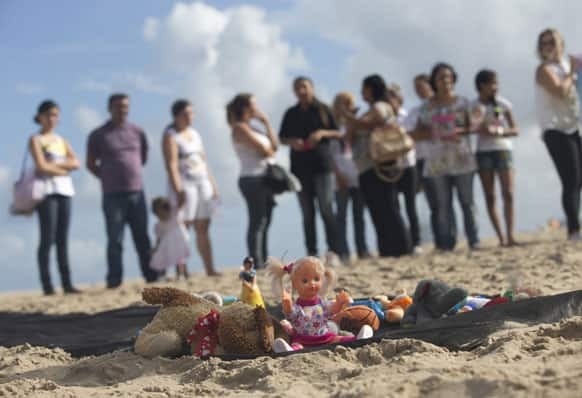 People protest in front of toys representing young victims of violent crimes in Rio de Janeiro, Brazil. First lady Michelle Obama smiles has she dances with President Barack Obama during The Inaugural Ball at the Washignton convention center during the 57th Presidential Inauguration. 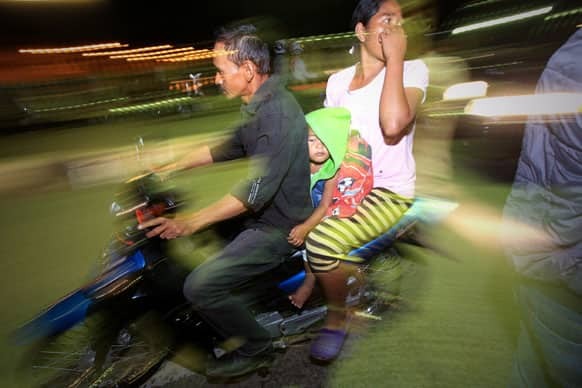 People on motorcycles flee after a strong earthquake hit in Aceh, Indonesia. A strong, shallow earthquake rocked parts of western Indonesia early Tuesday, killing a 9-year-old girl, panicking residents and ruining homes. Several other people were injured. Russia`s Maria Sharapova celebrates after defeating compatriot Ekaterina Makarova in their quarterfinal match at the Australian Open tennis championship in Melbourne. 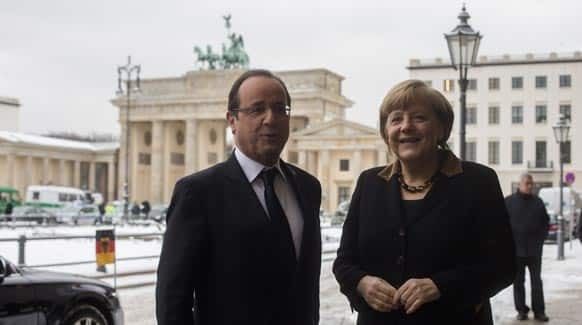 French President Francois Hollande, welcomes German Chancellor Angela Merkel in front of the Brandenburg Gate near the France embassy in Berlin. 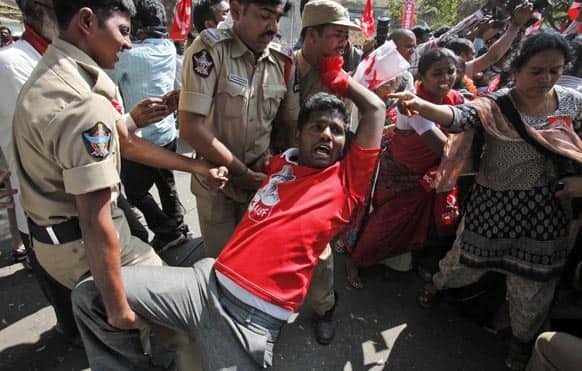 Police detain a left wing party activist during a protest against power tariff hike in Hyderabad. Left wing parties are demanding withdrawal of hike in electricity charges and cooking gas price. Workers clean up the basement of United Overseas Bank Plaza after it was damaged by floodwaters in central Jakarta. 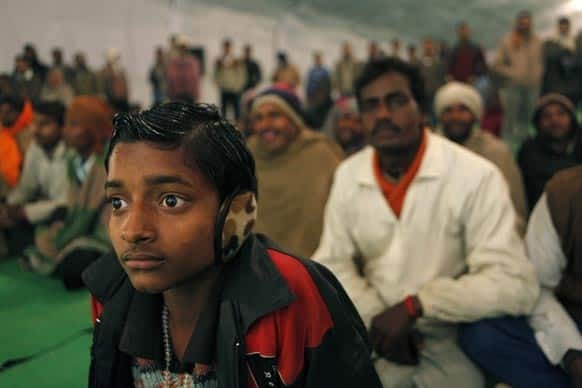 People watch a Nautanki, a traditional form of entertainment, at Sangam, the confluence of the holy rivers Ganges and Yamuna and mythical Saraswati during the Maha Kumbh Mela in Allahabad. President Barack Obama and first lady Michelle Obama walk in the Inaugural Parade during the 57th Presidential Inauguration in Washington. 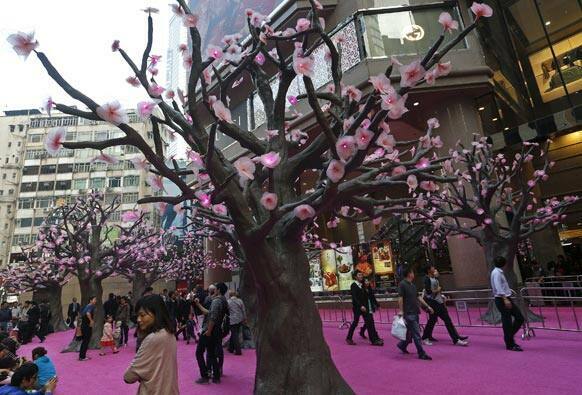 People walk past Chinese New Year decorations at a shopping mall to celebrate the Year of the Snake as the Chinese lunar New Year starts on Feb. 10 in Hong Kong. 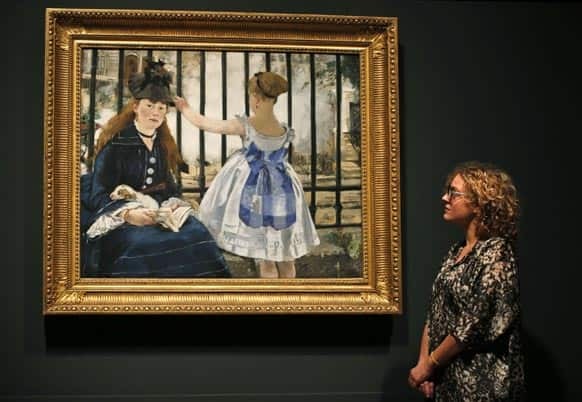 A Royal Academy of Arts employee poses for photographers in front of Manet’s oil on canvas painting entitled `The Railway, 1873` at the gallery in central London. Gay rights campaigners kiss each other during a protest outside of State Duma, Russian Parliament`s lower chamber, in downtown Moscow. 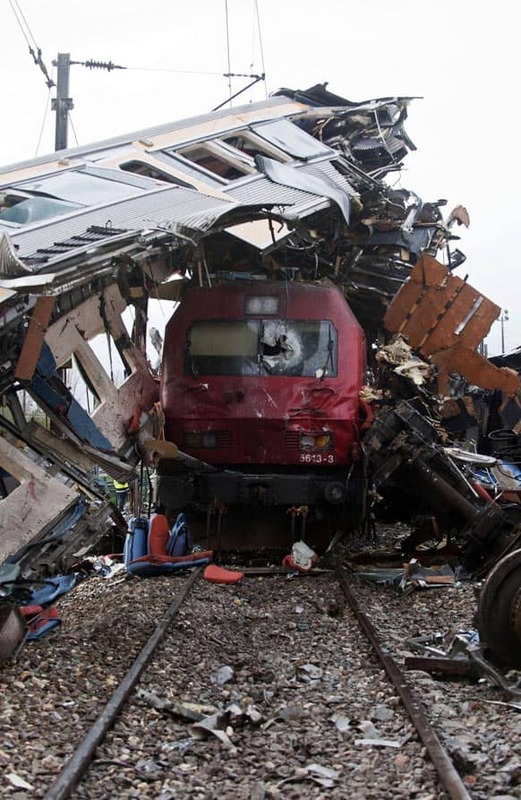 A train sits beneath the carriage of another train after a train crash at a station in Alfarelos, Portugal. 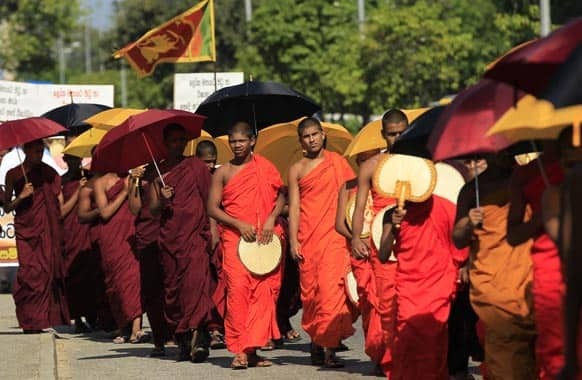 Sri Lankan Buddhist monks march towards the president`s residence demanding authorities to stop sending Sri Lankan women as maids to the Middle East following the recent beheading of a Sri Lankan maid by Saudi Arabia, during a protest in Colombo. Emergency workers search the site of a fatal car crash on the Egnatia Highway in the village of Kleidi near the northern Greek port city of Thessaloniki. 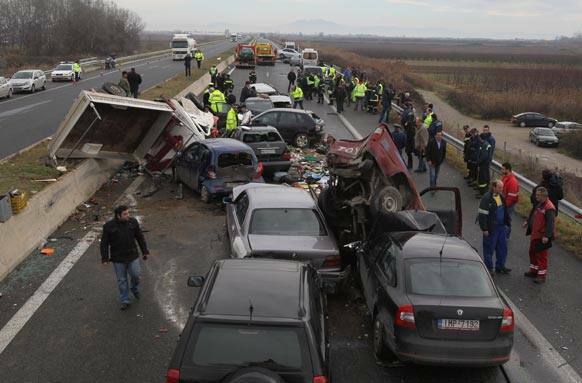 One person was killed and 24 others were injured in two nearby pile-ups that occurred amid heavy fog in the area. 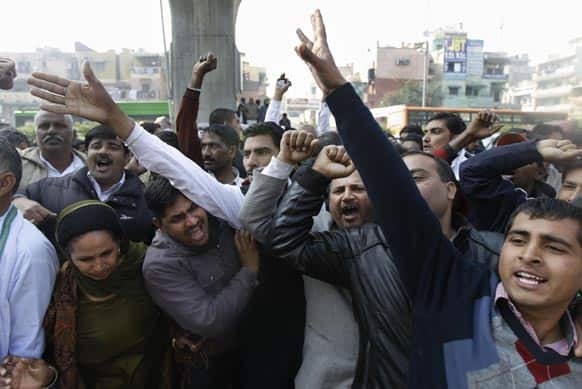 Supporters of former Haryana state Chief Minister Om Prakash Chautala shout slogans outside a court in New Delhi. 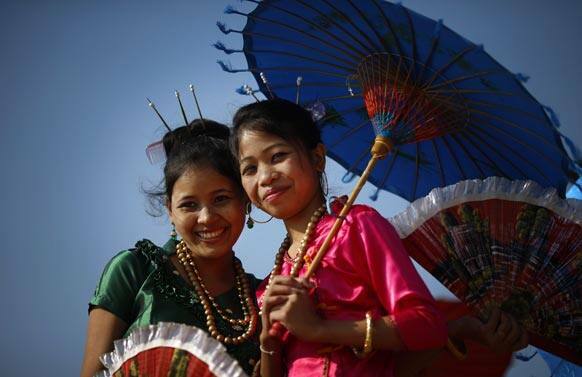 Women wearing traditional attire from the north eastern Indian state of Tripura perform on their state tableaux that will participate in the Republic Day parade, during a press preview in New Delhi. 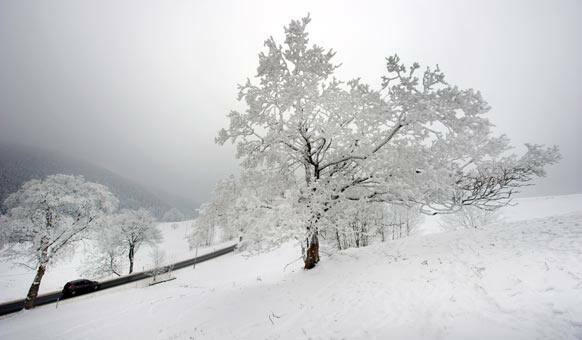 A car passes ice and snow covered trees near Oberpoebel, eastern Germany. 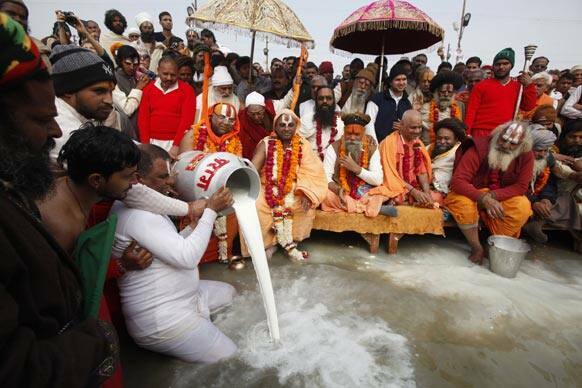 Hindu holy men, pour milk into the waters as they performs rituals at Sangam, the confluence of the rivers Ganges and Yamuna during the Maha Kumbh festival in Allahabad. 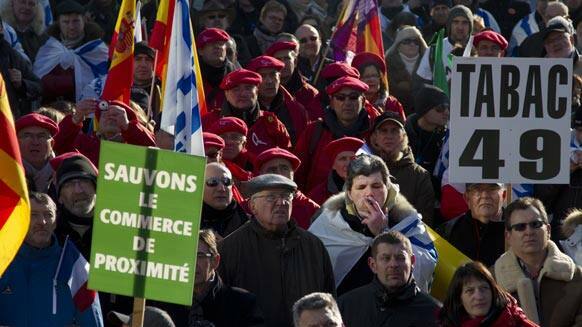 A man, center right, smokes a cigar as he stands with demonstrators marching against EU tobacco regulations in front of EU headquarters in Brussels. 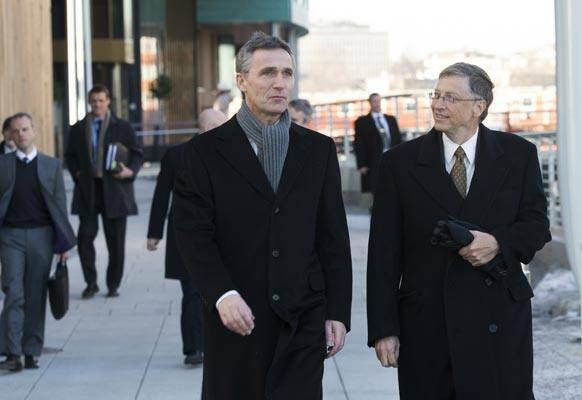 Norwegian Prime Minister Jens Stoltenberg, left, walks with Microsoft founder Bill Gates in Oslo. They met during a seminar which discusses challenges of international aid and health. 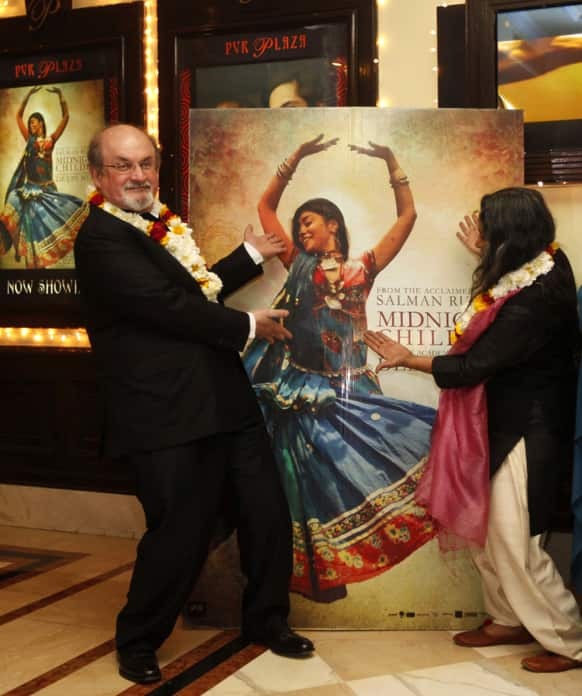 Author Salman Rushdie and director Deepa Mehta pose for the media before a screening of `Midnight Children` at a movie hall in New Delhi.